Call 877-242-3136 and purchase this item for $1,360.00 with our "Advanced Replacement" option. 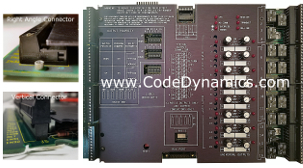 The Universal input/output board can provide Direct Digital Control for virtually all electronic or pneumatic analog devices. The board is also equipped with an RS-232 Serial Port for local diagnostics. Contains 32 universal inputs that can be programmed by a simple command to accept information in one of four modes: temperature, voltage (0-8 VDC), digital (on/off), or counter (pulse signal up to 10 Hz).